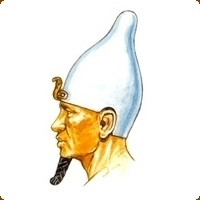 The Hedjet or White Crown of Upper Egypt is a tall white conical headpiece and was used in later times to denote the pharaohs rulership of Upper Egypt. 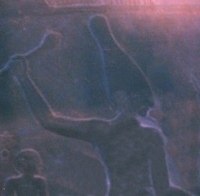 One of the earliest depictions of the White Crown can be found on the Narmer Palette, displayed in Cario Museum. It was found in Hierakonpolis, by the British archaeologist J.E. Quibell during excavations in 1897/98. The White Crown goes forth, having swallowed the Great One, the tongue of the White Crown gulped down the Great One, but the tongue was not seen. O Horus meet me, for I wear the White Crown, the Eye of Horus wherewith one is strong. The God Osiris often shown showing wearing the White Crown of Upper Egypt and often became the Atef crown with the addition of feathers. The White Crown is sometime depicted in other colours such as yellow, one vignette, in the Harris Papyrus, shows Ramesses III before the Gods wearing the White Crown but is painted yellow. The White Crown is also often shown combined with the Red Crown of Lower Egypt signifying that he was the King of all Egypt. Throughout Egypt's long history the regalia of the pharaoh shows quite clearly the concept of two distinct and separate nations united under one monarch. As early as the Late Predynastic Period (Naqada II culture) the leaders of these two nations can be identified by their distinctive crowns which formed an important part of royal symbolism in later periods. Upper Egypt stretches from south of Cairo to Elephantine, now modern Aswan. The symbol for Upper Egypt was the flowering lotus.